We are glad to announce we will headline the 2017 edition of Padova Metalfest. The openair takes place in Torreglia (Padova, Italy), in the area close to the Green Lake (Lago Verde). 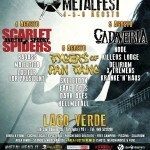 Join this three days festival with CADAVERIA, Node, Tygers of Pan Tang and many other bands! Check out more CADAVERIA live dates here and subscribe to our newsletter to get updates on future shows and band news.